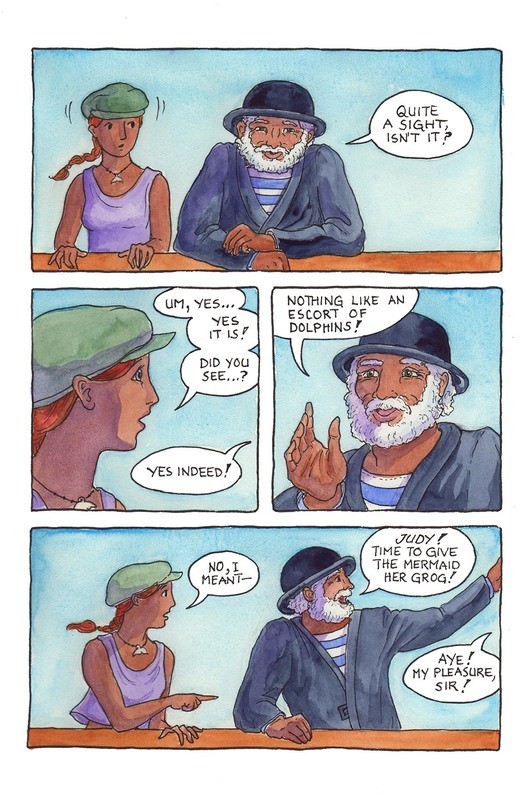 Page 38 — Sami and Mr. Jones conversing at cross-porpoises (sorry, couldn’t resist). It’s Monday! And yes, this is a wee bit later in the day than usual, but I am catching up. I tried something new with this one, in omitting a background in order to focus on the two characters. Then I couldn’t decide what colour to paint around them (kind of boring to leave it just white), so I did something I very rarely do: scanned the partially done page into the computer and played with colour backgrounds. I had thought about a nice sunny yellow, but it seemed too warm to capture the sea air, and eventually settled on this sky blue. It looked nice but kind of flat, even with a gradient, so I went back to my watercolours, which was my intention anyhow. The Manganese Blue Hue captured the look I wanted quite nicely, with enough variation and texture to make it look natural. I’m happy with the clean, uncluttered look here. But don’t worry, I’m not going to dispense with backgrounds! I just think it’s nice to rest the eyes once in a while. Hope you enjoy this page — next post on Friday! This comic was posted in Mermaid Music and tagged comic, dolphins, graphic novel, mermaid, mermaid comic, sailors, sea comic, ship, watercolour, webcomic.